Suede shoes can make a person look very chill and casual. They’re one of the most popular types of casual footwear on the market; many people around the world are choosing them over regular rubber shoes more than ever. Given that many people buy new suede shoes each day, we’ll be helping you understand how to properly clean them and care for them. You might have some of the most effective suede-cleaning items around your house, but we’ll let you know a list of the most important ones to begin with, so you can get a better idea of what you’re getting into with our guide. Keep in mind that there might be other rougher ways with which you could also clean suede shoes, but we’ll guide you through the ones that won’t cause damage to your footwear. Before going into further detail about each specific method, let’s first take a quick look at the items you might need to use in some of them. 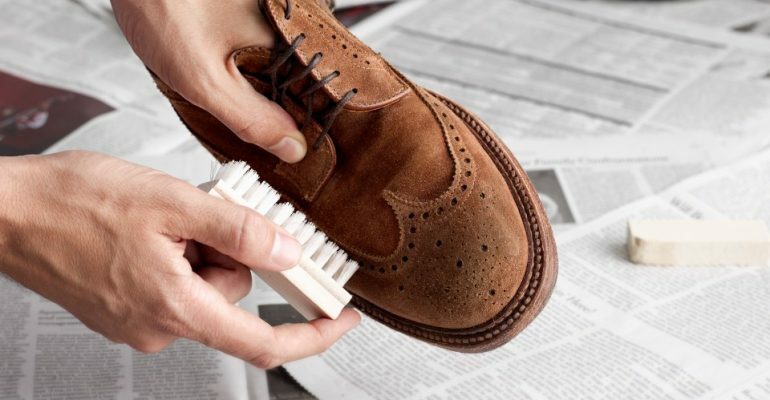 Brushing suede shoes must be done with a delicate tool. Although you could also use toothbrushes or other rough towels, you’ll have to be extra careful if you want to avoid permanently damaging your footwear. Specialized suede brushes are ideally crafted to treat delicate surfaces – you’ll still have to be careful when you brush the shoe, but damage to the footwear is less likely to occur. If you’ve owned suede shoes for a long time, you might’ve already noticed how certain spots tend to get dirtier than others. This happens because some parts of the shoe are more prone to getting dirty or catching certain unfortunate substances from the ground. Rough erasers are ideal to be used as tools in the removal of dots from suede. When we talk about rough erasers, we’re referring to erasers like those you find in some pens, or even the ones included in traditional pencils. Depending on what gets stuck in your suede shoes, you might need to get your hands on a spatula to remove it. Any type of hard spatula will work (like those hard-plastic spatulas that most people have on their kitchen), but if you own a metal spatula, even better. There are certain liquids capable of easily removing dirt and grime from your suede shoes. 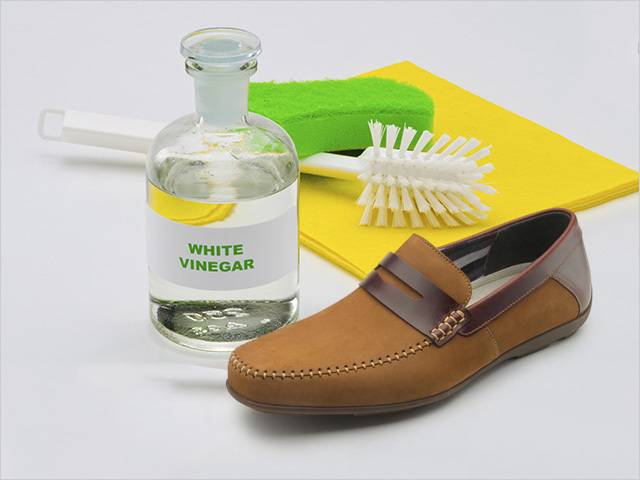 Take vinegar, for example: small quantities of vinegar can be applied to your brush – gently applying it to the shoe can make the suede look almost as good as new! Having access to water is also extremely important. You’ll also need a few small bowls where you can pour each substance in, so you can have access to each one more comfortably. Brush off any dust or small particles present in your shoe. Move the brush in a single direction. Relentlessly brush scuffed edges until you see improvements. If there are traces of water marks on your shoe, apply a little water to the back of your specialized brush and gently scrub the affected are of the shoe, then let them dry overnight by putting a towel inside the shoe itself. If you plan to use water in the cleaning process, be sure to clean the entire shoe. Water tends to discolor suede; if you clean the whole shoe, the potentially lighter color won’t be noticeable. 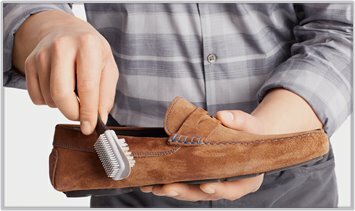 The most straightforward way to clean your suede shoes is by using a brush. As we mentioned before, you might want to purchase a specialized brush if you want to get the best results. Liquids are very likely to cause damage to your suede shoes, so you might want to avoid applying it directly. The best way to clean your shoes without liquids is simply by using a brush. Keep in mind that suede is a very sensitive material, and it’s VERY prone to damage. Brush it as gently as you can and try to keep your hand’s movements as even as possible. As an important side note, make sure not to brush back and forth! This can cause a lot of damage to the suede. Brush strictly in a single direction. Quick brushing might damage the shoe if it there’s too much dust. Small particles are the most fearsome enemy of suede footwear as they can tear the fabric relatively easily without you even noticing it. Scuffed edges might require incessant brushing if you want to get rid of them. Be careful not to apply to much pressure to the shoe when you do this, though. Water can also be applied if you intend to remove water stains, but it must be done in a moderate way or the suede can get torn apart. As you might already know, suede can retain stains even after constant brushing and scrubbing. In some instances, and to avoid scrubbing too hard, it might be better for you to use vinegar to swiftly remove the stain. Don’t be tempted to use your brush if you want to apply vinegar to the stain. Grab a small towel or a rag and gently soak it in a bowl filled with vinegar (or directly apply vinegar from the bottle if you wish). Once soaked, all you must do is apply the vinegar to the stain in the suede. Vinegar can leave the shoe with a very potent odor, and it’s likely to remain there for at least a couple of days. Use this method in extreme cases only! Also, be sure to dry up the vinegar once you’re done. To do this, all you need is steel wool. You can use one of those steel wool sponges used to do the dishes. Be sure to brush the shoe firmly – but do it in a single direction only! Steel wool can be detrimental to the fabric and it should be handled with extreme care. If you have a nail file laying around your house, you can also use one of its sides to gently scrub off any remnants of the stain. If this doesn’t work… You might as well give up and take the shoes to a specialist! It’s one of the most effective home methods that you can use to clean suede. 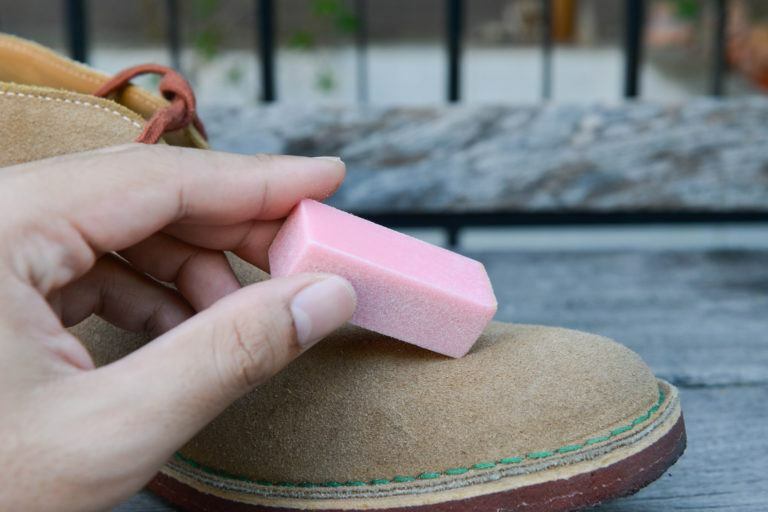 As strange as it might sound at first, rough erasers are great at removing stains from suede shoes. Certain stains might not come off easily, even if you use water and vinegar to make it go away. In extreme cases, you can rub a rough eraser on the stain to make it go away quickly (you don’t need to soak the eraser on any liquid). The best types of erasers you can use for this method are pencil and pen eraser. In fact, pen erasers are ideal because they’re made to remove ink, which makes them very powerful. Don’t be afraid to rub the eraser on the shoe; the suede is unlikely to tear with this method because you don’t need to rub it for an extended period. Rub the stain with the eraser until it comes off. Check your progress every 5-7 seconds to make sure you’re not overusing the eraser on the shoe. If no progress is being made in removing the stain after over a minute, try a different eraser (or a different method altogether). Suede is especially susceptible to sticky things, such as chewing gum. It can cause a lot of damage to the shoe. Trying to remove gum by force could cause more damage than anything, so you must be careful as to how you approach this situation. There is, however, a simple way to remove sticky material from the shoe’s fabric. First, clean your shoes. If you want to use water to do so, make sure you let them dry afterwards. Once dried, put them inside your home’s freezer and let it stay there for three to four hours. This will make the gum or sticky material harden, allowing it to come off even easier than you think. Take the shoe out of the freezer after time’s up and grab one of those metal or hard plastic spatulas that you probably have on your kitchen. Carefully peel off the sticky thing from the suede, making sure not to damage the fabric while you do it. This will make most of the material come off. Scrub off the remnants with a brush or towel, and you’ll be good to go! If you’ve ever had ink spill into any clothing item, you know how inconvenient it is to remove it. There’s an easy way in which you can easily do it if it falls in one of your suede shoes. All you need to do is grab a small rag and pour some alcohol on it. Then, just rub off the ink-stained part of your shoe until it looks as good as new. You can also use steel wool to remove ink stains, but this can damage your shoe. Make sure you try a simple alcohol cleanup first! 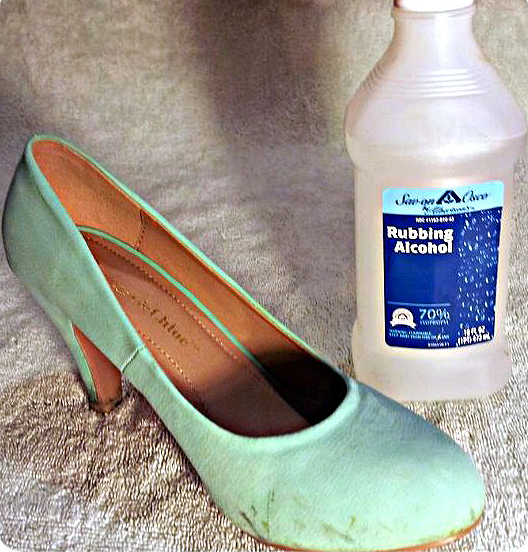 Keep in mind that, if your shoe loses some of its color because of the alcohol, you might need to apply the alcohol to the entirety of the shoe to make the color uniform again. It’s not ideal, but it might be the only way to make the suede look the same color again. Side note: If the ink is freshly spilled, just use dry towels to clean it off. The towels will soak up the fresh ink and it’ll save you the trouble of applying alcohol. We’ve shown you the best ways to clean suede shoes, but there are also ways to take care of them which prove to be very effective on the long run. For example, you should avoid wearing your suede shoes at all costs if you the weather looks like it’s about to rain. Water can cause tremendous damage to suede, so it’s better to avoid it at all costs. You can also purchase a special protector. Suede protectors can be applied before you go out of your home. They create a barrier between the environment and your shoe, catching splashes of water and dirt before they make their way to the fabric. Try to keep the shoes inside their box when you’re not wearing them – if you store them like you would do with any of your other shoes, they can catch a lot of dirt – especially if you don’t wear them often. Most of these methods work for almost any type of suede wear, so be sure to take care of our items to make them last for as long as possible!